Sorry for the “radio silence” here on my blog, as my writing and blogging friend, Melissa, has so aptly referred to it. When my blog is quiet, there’s always a reason…or ten. This time is no exception. 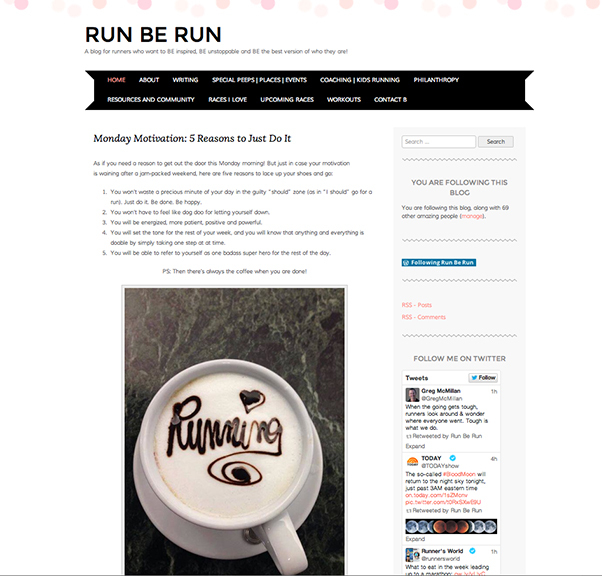 I won’t list all the things that have consumed my writing time, but rather share the most exciting thing: a new blog/website I just launched called Run Be Run. I know I’ve shared a few of my stories with you in the past about what running means to me, but in the last couple years this sport has taken a front seat in my life as I’ve started racing again and coaching several kids running teams. I wanted to create a site that not only shared my passion for the sport, but also celebrated the everyday joys and challenges of being a runner. And of course, there will be a large dollop of “life” thrown in along the way, because, well…that’s just who I am, never one to stick strictly to a script. Run Be Run is still a work in progress, but I hope you’ll swing by and check it out. If you like what you see and would like to receive automatic updates each time I post a new tidbit, you can sign up via email in the right side of the blog. If not, I promise I won’t look at you sideways. Here’s a peek at Run Be Run. You can click HERE or on the image below to go to the site. I’ve missed connecting with you here, dear readers! I still plan to continue this blog and also my ongoing book project, The Art of an Improbable Life, so if you stick with me a bit longer, I’m hoping to be back up and blogging consistently once again. Thanks for all your support! My cup runneth over! I can’t wait to catch up with you all! Tell me, what’s the most interesting thing you’ve done so far this year? This entry was posted in Random Musings, Writing and tagged celebrating runners, celebrating running, health and fitness, inspiration, marathon runners, new blog, Run Be Run, running, running blog, www.runberun.com by Becky Green Aaronson. Bookmark the permalink. Sounds fantastic, Becky. I always believe in following your passion, so if it’s running, then how wonderful to expand your love of running into writing about it! I’m on my way to check it out! Thanks, Monica. This new running blog has been brewing inside me for quite some time, so I’m finally making the time to pull it together. It’s a work-in-progress, but I’m having a lot of fun with it. Great to hear about your new blog, and I will be checking it out! I haven’t been online as much lately–computer issues and struggling with a new system. I used to be a runner, and I hope someday to be one again. Most interesting thing I’ve done so far? Starting a freelance editing business. And starting a garden! Tina, I don’t know how I missed your comment! So nice to hear from you! As far as I’m concerned, once a runner, always a runner (at heart, if nothing else). You know the thrill of pushing yourself beyond your comfort zone and seeing what you can do. 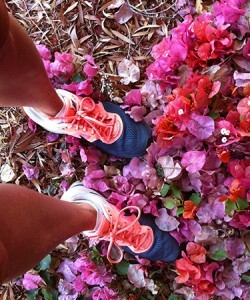 Perhaps this will be your spring to lace up your shoes again! A hearty congrats on your new editing business! How is it all going? I do read your blog, but I’m always kicked off your comments, so I haven’t been leaving any. Sorry, my friend. And I’m envious of your garden! Love it! S.O.S, different day, working on a large skylight, writing is back seat until this is done. Doing the writers conference in June, number four for me. New tango dancing girlfriend/artist/hiker/writer, lives in Ventura, Teal Rowe. Life is super, planning to go to Buenos Aires in the fall (their spring). Looking at other possibilities of living somewhere.